The 2010 Dietary Guidelines for Americans recommend limiting your intake of solid fats and added sugars to between 5 and 15 percent of your daily diet. Added sugars increase your calorie intake without providing the body with essential minerals. They also increase your risk for diseases such as diabetes, heart failure and obesity among others. Traditionally, fruits were the primary sources of sugar. Today, you find processed sugar in almost all packed foods. Natural sugars available in milk, lactose and fruits benefit the body. Additionally, taking sugar in moderation helps your body function properly. Sucrose, available in table sugar, serves as your body’s primary energy source. Your small intestines produce sucrase, which breaks down the sucrose into fructose and glucose for easier absorption into the blood stream. It then travels to the liver for processing and distribution into cells, where it metabolizes into an immediate energy source. Your body also stores extra glucose as glycogen. When the primary source of energy is unavailable, your body breaks down the glycogen into single glucose units. They serve as energy sources during workouts, at night, when you take a rest and in between meals to prevent dangerous drops in your bloods sugar levels. Sugar critics frown on sugar for its lack of nutritional value; it delivers empty calories to the body. Nutritionists advise that you use complex carbohydrates such as starchy vegetables, cereals and grains as your main sugar sources. Simple sugars metabolize fast, causing rapid blood sugar spikes and drops. Complex carbohydrates help with more stable blood sugar levels, sustained energy levels and provide more vitamins and minerals than simple sugars. Several scientific studies also indicate that sugar ultimately affects your health negatively. A sugar-laden diet increases your risk of heart disease, obesity, diabetes and dementia among others. Sugar taps into your preference for sweet tasting things and can easily become addictive. 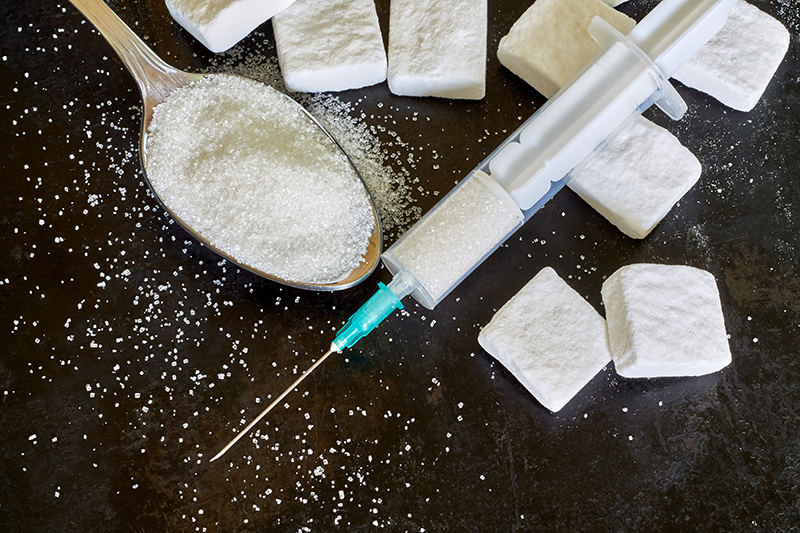 While you cannot liken sugar ‘addiction’ to drug addiction, people that experience sugar cravings often exhibit dependency symptoms. A good example is obese people, who keep taking sugary things even when they experience difficulty walking or breathing. Every time your sugar intake goes beyond the recommended levels, you increase your risk for diabetes by up to 1.1 percent. Over a prolonged period of time, diabetes becomes inevitable. Diabetes further increases your risk for heart disease; over 65 percent of diabetes deaths occur from a heart-related complication. Sugar intake also increases bad cholesterol levels and dangerous triglyceride blood fats, while inhibiting your body’s ability to clear our bad cholesterol. High sugar levels in the blood affect your face. Sugar attaches to proteins, forming new molecules such as advanced glycation end products or AGEs. The new molecules attack and damage nearby protein, including collagen and elastin, the components that help your skin remain firm and elastic. Eventually, skin proteins become brittle, leading to wrinkly and saggy skin. AGEs further promote the growth of fragile collagen, which affects your body’s natural antioxidant enzymes. This affects your skins ability to deal sun damage and environmental toxins. Sugar triggers your liver to increase its fat storage in weird places; eventually, globules of fat develop around your liver, heart and around your stomach. This can gradually lead to liver and heart disease. Ultimately, sugar is not the enemy; your consumption of sugar is the problem. The first step to reducing health risks associated with sugar is reducing your intake of simple sugars, and choosing complex sugars instead. Some changes in the beginning may include a sugar-free diet, where you only rely on natural sugars from carbohydrates and fruits.